Muhammad was arrested this weekend for threatening to blow up a lawmaker’s home. 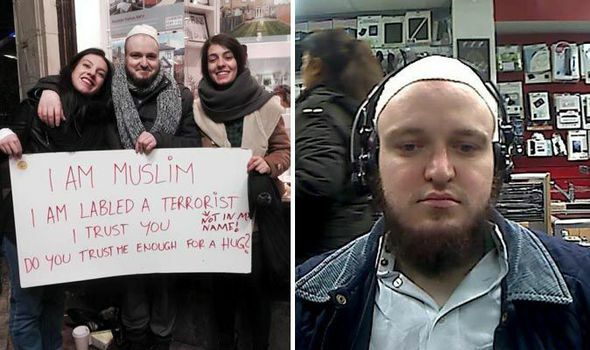 A WHITE Muslim convert who protested outside Parliament with a sign emblazoned with “I am a Muslim, do you trust me enough for a hug?” is facing jail after threatening to bomb a Tory MPs house. Craig Wallace, also known as Muhammad Mujahid Islam, used a sign as Stop the War protestors came to Westminster for the vote on British airstrikes in war-ravaged Syria. But Wallace, 23, could be now facing up to six months in jail after he trolled MP Charlotte Leslie on Facebook saying he would “drop a bomb on her house”.